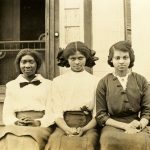 An interactive research portal highlighting primary resources about Alabama women found in the Division of Special Collections. A vital way of making sense of the past is to look at personal accounts of the people who lived it. American women’s stories, unfortunately, have often been harder to capture than men’s. For much of modern history, their sphere was the home. Participating less in public life meant less of a public voice — and less of a public record. For women in minority groups, these voices and records were even more likely to be devalued or ignored. Southern women’s lives are in particular danger of receding into the darkness. Their real experiences and personalities are easily overshadowed by their cultural portrayals, some faithful fictions and some outright caricatures, books from Gone with the Wind and Fried Green Tomatoes to The Color Purple and The Help; films from Steel Magnolias and Coal Miner’s Daughter to Beasts of the Southern Wild and Winter’s Bone; and television shows from Designing Women and Dallas to True Blood and Nashville. But what have Southern women actually understood their lives to be about? What did they experience on the farm or in the city? How did they feel about owning slaves or being slaves? Were they true Confederates or did they feel like outsiders? How did they react to emancipation and Reconstruction, to electric light and the telephone, to industrialization and the right to vote? How did they live during the Great Depression, World War II, the Age of Aquarius? Where were they when they heard that President Kennedy had been shot, or Martin Luther King Jr? How did they feel when they saw the moon landing or the fall of the Berlin Wall? The questions are endless. 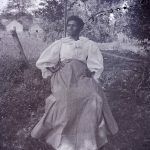 With so many collections focused on local people and places, the University of Alabama Libraries Division of Special Collections is a good place to research the lives of Southern women, in particular those from Alabama. Every woman on the maps below has real ties to Alabama, having spent some significant portion of their lives in the state. They are spread out through dozens of collections, so they have been brought together here, so as to emphasize their depth and breadth and facilitate research. 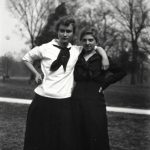 The Maps section presents various visualizations of all the women’s lives you can explore via the W. S. Hoole Special Collections Library or the A. S. Williams III American Collection. Click on each marker to bring up biographical information and content descriptions, and to find out how to access the associated archival materials, including links to any online finding aids or digitized items. Women are listed by the name they used when they created the items discussed, with any later married names also included, but in brackets. In some cases, we don’t know much about the creator beyond what one can glean from the materials themselves, and we don’t always have time to explore them thoroughly. If your research into any of these women and their materials turns up data others might find helpful, please let us know. You can contact Kate Matheny at kgmatheny@ua.edu. The Glossary gives an overview of and commentary on the forms you will encounter when digging into these women’s lives. It also gives definitions of the various genres, some of which are familiar but others which may not be. The Resources section provides a list for further reading. All items or collections are available via UA Libraries, and info about how to find them is given below. A list of Collections referenced on the map, including links to Finding Aids if they are online. 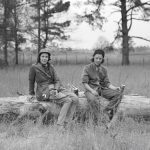 A list of Secondary Sources for further research, books that address various aspects of Alabama, Southern, and American women’s history. The About section lists the team of people involved in creating this portal and briefly describes how it all came together. 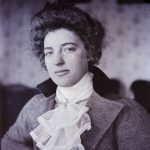 The maps below allow for different ways of discovering women to research, based on either the format of the materials in their collections or the historical era those materials reflect. In a few cases, a woman’s name will show up in multiple lists on the same map, because she generated materials in multiple formats or covering a fairly broad period of time. The Notes field should indicate this. On either map, if you’d like to see a larger version, use the icon at the top right corner to launch the map in its own browser tab. While most forms included here were created at the time the events took place, some are retrospective. One such after-the-fact genre, the oral history, occasioned a rethinking of this project to include non-written sources. What retrospective reflections and narratives lose in the immediacy of detail and the freshness of the telling, they gain in big picture contextualization and interpretation. And they often cover a much broader period of time, allowing for discussions of long-term growth and development of the person and the society they lived in. Most forms included here are also first person, that is to say, they are created by the woman who compiled them. Some, including the autograph book and the memory book, are second person; they record thoughts and feelings of others as addressed to the compiler. Most are in many ways third person objects, collecting the writings and thoughts of others who don’t even know their words and ideas have been cherished by someone else. In all cases, the motives and personality of the compiler are still central. Most importantly, many of the items included here do not neatly fall into one genre or even two. In part, this is because genres are descriptions, not prescriptions, so they reflect the messiness of reality. Personal books are also subject to the motives and needs of the creator, needs that might be complex or change over time. One example is the scrapbook/diary of Mamie Kennedy Perkins. 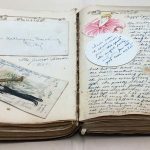 The left-hand pages are filled with programs from her musical performances in the 1870s and 1880s; the right-hand pages were filled with diary entries from the 1890s. Did she paste in those programs when the events happened, then return to the book for a different purpose? Or did she use empty facing pages in a diary to save cherished memories? A blank book used to capture signatures, messages, quotes, poetry, and other writings from friends and acquaintances, as well as drawings. Sometimes ephemera like calling cards or photos might be included. A personal anthology of aphorisms, short passages from literature, poems, and other notes transcribed into a blank volume to serve the memory or reference of the compiler (definition of commonplace book from Society of American Archivists). 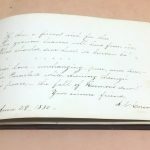 In the 19th century, women used the genre for poetry as well as recipes, both often clipped out of newspaper, such that it became a species of scrapbook. This practice fell out of favor in the early 20th century. A document, usually bound, containing a personal record of the author’s experiences, attitudes, and observations (definition of diary from Society of American Archivists). 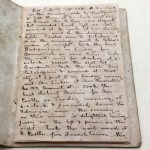 Some of these books were made to be diaries, with pre-printed sections set aside for each day, while others are simply blank books or notebooks. They may include non-narrative elements, such as drawing or poetry. 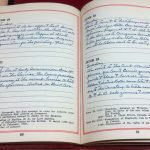 There are subtle disctinction between this format and a journal (see definition of journal from Society of American Archivists), but in our practice, the two terms are used relatively interchangeably. A pre-printed book designed to be filled in with specific information about one’s life and experiences. 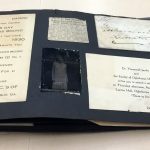 Most in our collections are early 20th century precursors to the high school yearbook, providing space for students to record info about the school and messages from friends, classmates, and teachers. It functions similarly to an autograph book in content and a scrapbook in format. 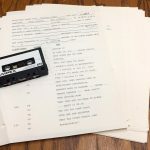 An interview that records an individual’s personal recollections of the past and historical events (definition of oral history from Society of American Archivists). This genre is something like the spoken version of a memoir — with all that difference the medium entails, including less formality, no after-editing, and often the presence of another person or persons to ask questions or give prompts. A blank book, often with a simple string binding, used to store a variety of memorabilia, such as clippings, pictures, and photographs (definition of scrapbook from Society of American Archivists). The scrapbook is a wide-open genre incorporating any number of media. It is especially congenial to the assembly of ephemera and souvenirs, sometimes becoming less like a book and more like a treasure trove. A contemporaneous or retrospective account of a trip or vacation, sometimes taking on the character of a scrapbook, with photos, maps, and memorabilia accompanying diary-style narrative and commentary. 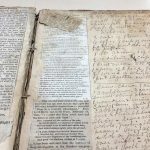 This page was created by Kate Matheny for the Division of Special Collections at the University of Alabama Libraries, with the helpful guidance of the Alabama Digital Humanities Center. I believe in being transparent, especially when I think an understanding of my process might be helpful to others. If you would like to create a similar kind of data map, it mostly takes a lot of patience, not a lot of technical know-how. I combed our archives database for items that fit the bill, then created a spreadsheet with metadata harvested or adapted from current finding aid data and/or created through additional examination and processing. But before I had collected more than a sample size of data, I consulted with Emma and Tyler, who helped me conceptualize the project (just what is this thing?) as well as think through how best to translate the data into a useful map. Though we had planned to use Google Fusion Tables to generate the map, which would have involved some extraneous coding from Tyler to make the display behave as we wanted — notably, to render a lot of descriptive text as a sidebar flyout, rather than a pop-up — we found that Google My Maps could accomplish most of our goals without additional jiggery-pokery! My Maps provides a graphic interface through which you can upload structured data as an overlay and tailor the visualization to suit your needs. (Alternatively, you can create points and lines on a map from scratch within the interface.) It does have its limitations, though, so we created two separate maps, rather than attempt to deploy complex filtering within one. Also worth noting is the question of where to house the project, and how best to organize it. Steven helped me determine that a one-page setup was the way to go, from a usability standpoint. Moreover, he drove me to think about the project in context, what part of the website it would live in and, more importantly, whether it might be the first of many such portals in need of a concerted online home.